The stunning, warm honey color of this 14K yellow gold infinity inspired diamond band from Apples of Gold Jewelry combines with five diamonds to create a wonderful look that is full of love. The three infinity symbols that go around the front of the band each have a small diamond in the center, while a larger diamond separates them - bringing the ring to a total of 5 diamonds. The diamonds total 0.08 carats and are rated H-I for color and SI for clarity. The beautiful band ring can be worn as a wedding band or as a statement ring. 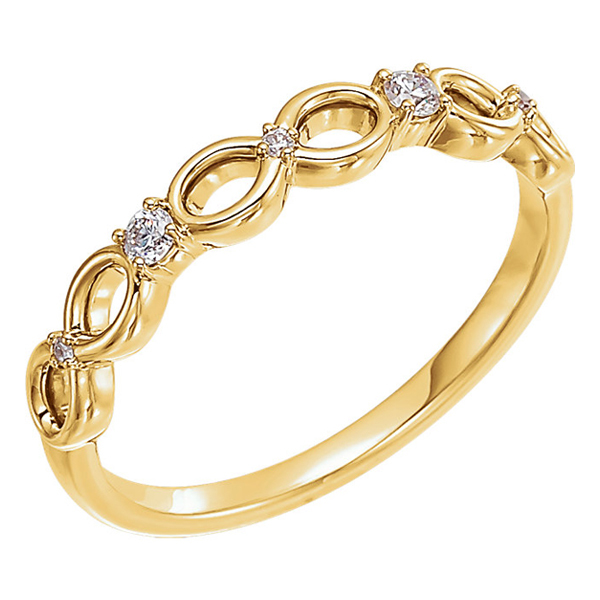 We guarantee our Infinity Inspired Diamond Band, 14K Yellow Gold to be high quality, authentic jewelry, as described above.